Evidence increasingly suggests that insufficient or disturbed sleep is associated with metabolic disorders such as type 2 diabetes and obesity, and addressing poor quality sleep should be a target for the prevention – and even treatment – of these disorders, say the authors  of a Review, published in The Lancet Diabetes & Endocrinology journal. “Metabolic health, in addition to genetic predisposition, is largely dependent on behavioural factors such as dietary habits and physical activity. In the past few years, sleep loss as a disorder characterising the 24-hour lifestyle of modern societies has increasingly been shown to represent an additional behavioural factor adversely affecting metabolic health,” write the authors. Addressing some types of sleep disturbance – such as sleep apnoea – may have a directly beneficial effect on patients’ metabolic health, say the authors. But a far more common problem is people simply not getting enough sleep, particularly due to the increased use of devices such as tablets and portable gaming devices. Furthermore, disruption of the body’s natural sleeping and waking cycle (circadian desynchrony) often experienced by shift workers and others who work outside daylight hours, also appears to have a clear association with poor metabolic health, accompanied by increased rates of chronic illness and early mortality. Although a number of epidemiological studies point to a clear association between poor quality sleep and metabolic disorders, until recently, the reason for this association was not clear. However, experimental studies are starting to provide evidence that there is a direct causal link between loss of sleep and the body’s ability to metabolise glucose, control food intake, and maintain its energy balance. The authors of the Review are Dr. Sebastian Schmid, University of Lübeck, Germany; Dr Manfred Hallschmid, University of Tübingen, Germany; and Professor Bernd Schultes, eSwiss Medical and Surgical Centre, St Gallen, Switzerland. People who were deprived of one night’s sleep purchased more calories and grams of food in a mock supermarket on the following day in a new study published in the journal Obesity, the official journal of The Obesity Society. Sleep deprivation also led to increased blood levels of ghrelin, a hormone that increases hunger, on the following morning; however, there was no correlation between individual ghrelin levels and food purchasing, suggesting that other mechanisms-such as impulsive decision making-may be more responsible for increased purchasing. Researchers in Sweden were curious as to whether sleep deprivation may impair or alter an individual’s food purchasing choices based on its established tendency to impair higher-level thinking and to increase hunger. “We hypothesized that sleep deprivation’s impact on hunger and decision making would make for the ‘perfect storm’ with regard to shopping and food purchasing-leaving individuals hungrier and less capable of employing self-control and higher-level decision-making processes to avoid making impulsive, calorie-driven purchases,” said first author Colin Chapman, MSc, of Uppsala University. than they did after one night of sleep. Sleep-deprived men purchased significantly more calories (+9%) and grams (+18%) of food than they did after one night of sleep. The researchers also measured blood levels of ghrelin, finding that the hormone’s concentrations were higher after total sleep deprivation; however, this increase did not correlate with food purchasing behavior. “Our finding provides a strong rationale for suggesting that patients with concerns regarding caloric intake and weight gain maintain a healthy, normal sleep schedule,” said Chapman. Follow up studies are needed to address whether these sleep deprivation-induced changes in food purchasing behavior also exist under partial sleep deprivation, though. Additional research should also look into sleep deprivation’s potential impact on purchasing behavior in general, as it may lead to impaired or impulsive purchasing in a variety of other contexts. Full bibliographic informationFull citation: “Acute sleep deprivation increases food purchasing in men.” Colin D. Chapman, Emil K. Nilsson, Victor C. Nilsson, Jonathan Cedernaes, Frida H. Rangtell, Heike Vogel, Suzanne L. Dickson, Jan-Erik Broman, Pleunie L. Hogenkamp, Helgi B. Schioth, and Christian Benedict. Obesity; (DOI: 10.1002/oby.20579). Sleep increases the reproduction of the cells that go on to form the insulating material on nerve cell projections in the brain and spinal cord known as myelin, according to an animal study published in the September 4 issue of The Journal of Neuroscience. The findings could one day lead scientists to new insights about sleep’s role in brain repair and growth. “These findings hint at how sleep or lack of sleep might repair or damage the brain,” said Mehdi Tafti, PhD, who studies sleep at the University of Lausanne in Switzerland and was not involved with this study. Additional analysis revealed that the reproduction of oligodendrocyte precursor cells (OPCs) — cells that become oligodendrocytes — doubles during sleep, particularly during rapid eye movement (REM), which is associated with dreaming. “Naps are actually more complicated than we realize,” said David Dinges, a sleep scientist at the University of Pennsylvania’s Perelman School of Medicine. Sleep experts break sleep down into several stages, which the brain cycles through roughly every 90 to 120 minutes. These stages are broadly characterized into non-rapid eye movement (NREM) sleep and rapid eye movement (REM) sleep. NREM is further broken down into stage one and two, which are considered light and intermediate sleep, followed by slow-wave sleep. Awakening from slow-wave sleep, the deepest kind, results in what doctors call sleep inertia or sleep drunkenness: that groggy feeling that can take awhile to shake off. Finally, there’s REM sleep, often associated with dreaming. Experts say the ideal time to nap is generally between the hours of 1 p.m. and 4 p.m. Napping later in the day could interfere with nighttime sleep. Siesta time for many cultures around the world bear out the benefits of a mid day nap. Christopher Lindholst, chief executive and co-founder of New York-based MetroNaps, has installed specially designed sleeping pods for Google, Huffington Post, an Iowa construction company and the Arizona Diamondbacks baseball team. The chairs retail for $8,995 to $12,985. ( I’m guessing most of us won’t be sleeping in 13K specialty chairs, and most companies will most likely put up with drooling on the desk rather than pop for these high tech sleep aids). 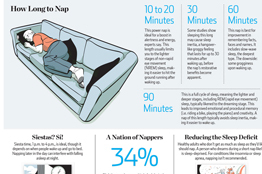 A version of this article appeared September 3, 2013, on page D1 in the U.S. edition of The Wall Street Journal, with the headline: A Field Guide to the Perfect Nap.